Curtis Castlewood continues his quest for championship gold tonight when he takes on PWE Northland Champion Stix in Whangarei. Castlewood and Stix will headline the Homecoming event, a fundraiser for Whangarei charity Soul Food. Tonight’s title match marks the first time the PWE Northland Championship has been defended in Whangarei. Known around New Zealand as the Uncrowned Prince, Castlewood hopes to drop part of his moniker and celebrate his coronation as PWE Northland Champion with a win this evening. “Everyone in Northland will bow to their new ruler, Curtis Castlewood,” he said. Castlewood has previously challenged for PWE’s Anzac Championship in a losing effort against Tank at Danger Zone. What started out as a one-off tag team match has turned into something much more, with a war of the words breaking out on social media between Brook Duncan, Paul Sayers, and Bryant – who will team with The Buggane against the Real Players at Homecoming. Duncan has threatened to kick Bryant and Buggane’s “big dumb caveman heads” off their shoulders in what has quickly escalated into somewhat of a personal feud, while the Rodeo Drive enforcer has likened Duncan and Sayers to a pair of “yappy dogs” who he claims he will silence in Whangarei. In addition to these featured matches, Scarlett defends the PWE Women’s Championship against JPE, and Ben Mana challenges Tank to the Anzac Championship match fans were supposed to see at Danger Zone. 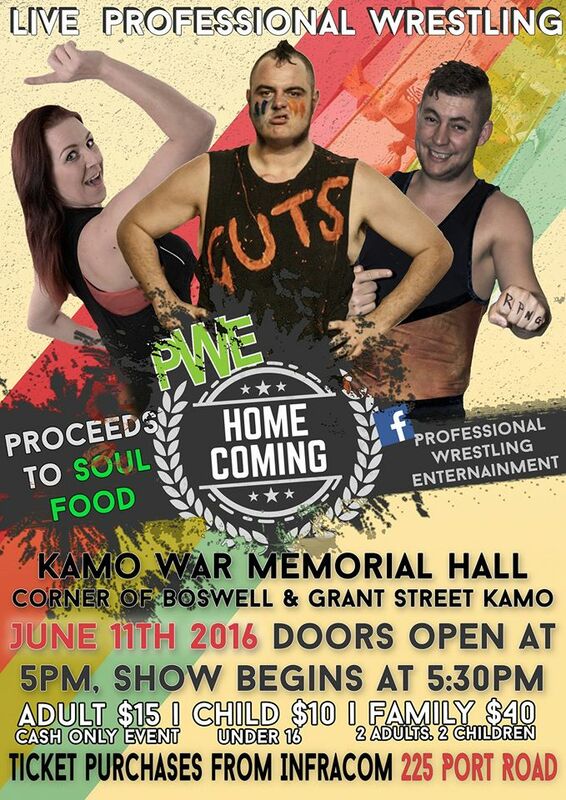 PWE Homecoming takes place tonight, June 11, at Kamo War Memorial Hall, Boswell Street, Whangarei. Doors open at 5pm with the first match scheduled for 5.30pm. Tickets are available on the door ($15 adults, $10 children). Proceeds from the event will be donated to Soul Food. The card, subject to change, is listed below.